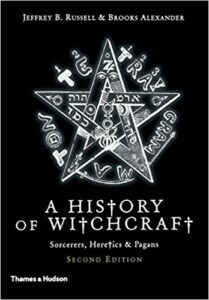 Russell does a magnificent job tracing the history of witchcraft from its origins to its current manifestations today. The book is top notch, complete with 94 pictures and illustrations to help readers get a feel for the different interpretations of witchcraft over the ages. Russell begins showing that there are many definitions of what a witch is: from the anthropological approach, a witch is a sorcerer from the historical approach, a witch is a Satanist from modern definition, a witch worships ancient gods and practices magic. He also attempts to debunk common perceptions of witchcraft such as witches don’t exist, witches practice Voodoo, or that witches participate in the Black Mass. Russell disputes these popular superstitions with modern and historical data, defining the definitions of ‘wicca’, ‘witch’, ‘warlock’, ‘wizard’, and ‘sorcerer’ along the way. Careful detail is spent describing sorcery and historical witchcraft. Russell talks about the Zande of the southern Sudan and their three varieties of magic: good, benevolent magic, such as oracles and diviners, amulets of protection, fertility rites, and even bagbuduma, homicidal magic used for revenge against those who had slain one’s kin. Sorcery, was magic from jealousy, envy, or greed, and was thought to be unjust. Finally, there was witchcraft, an internal power inherited from parents. Russell continues with a discussion of Voodoo and sorcery from ancient times. Next, European witchcraft is discussed, including the myth of the witches Sabbat where witches sacrificed babies to the Devil, renounced the Christian faith, and engaged in orgies. Russell explains that such a scene never occurred, but it became almost universally accepted. He then explains some of the most prominent interpretations of European witchcraft including Margaret Murray’s ‘Witch-Cult in Western Europe’ thesis and the holes in the theory, the Anglo-Saxon origins including selections from the Norse Eddas and the Diana, the Roman goddess of the hunt’s involvement. Russell explains that there were four elements to the formation of European witchcraft – sorcery, pagan religion, and folklore, and finally Christian heresy. During this time, the belief of a pact with the Devil became wide spread. The person, called a maleficus, always made the pact voluntarily, as in the Faustian legend. Here we get into the beliefs of sexual orgies, sacrificing children to the devil, and cannabilism. A focus is on Catharism and it’s emphasis on the Devil as the Spirit of Evil who created the material world led the shift towards the Devil’s growing power in popular belief. About 1450, with the Renaissance and Reformation, came the witch-craze, which lasted about 200 years. The rise was concurrent with the rise of Renaissance magic, which struggled to separate its wise and benevolent magic from the evil magic of the witches. A lengthy discussion of the witch trials of England and America, societal influences, and finally the decline of the witch hunts follows. The final section of the book gives a very unbiased view of modern witchcraft including bits on Anton La Vey and his Church of Satan, Gerald Gardner and the formation of modern witchcraft, and an overview of modern Wicca. This book is an easy read, full of pictures and anecdotes, that help weave together an excellent presentation of witchcraft from its beginnings to now.